Much has already been written this season about Bayern’s intermittently excellent pressing, on our site included. But the first half against the BVB was its crowning glory: counter-pressing, a high midfield pressing, a mixture of stability and a high, aggressive forechecking – all at a high level and consistent, at least in the first half. he Double Six (DMs). He supported striker Mario Mandzukic in pressing. Martinez and sometimes specifically Schweinsteiger pushed forward in order to neutralize Dortmund’s build-up play with a back-tilting midfielder (a midfielder who drops between the two centre-backs), mostly against Gündogan. Bender and Großkreutz posed no great threats in the build-up play, so they were deliberately put in a covering shadow and did not receive special focus. When Dortmund came into the last third of the field, this 4-4-2 changed. Kroos fell mostly back (closely before the midfield). Even the great runner and excellent Mandzukic was convincing in this regard: he released Kroos and the wingers, a few times taking their positions (mostly after ball losses). In pressing, Bayern Munich’s wingers acted at some times with extreme indention – they slid into the half spaces from their wide position and thus blocked the pass route of the half players to the full-backs which pushed them even more wide. This had several effects. One was less offensive compactness for Dortmund in passing. Passes came through to the sides but were usually faced in time, before Dortmund’s fullbacks could go for a cross or diagonal pass; thanks to the enormous leg work from all the players on the Bavarian side. Another factor was, of course, the increased pressure at the centre. Bastian Schweinsteiger and Javi Martinez could capture the ball directly and successfully. This meant that they could toe-poke the ball accurately to a teammate, rather than passing it into an open space (and thus into a renewed potential tackle) or capturing it directly themselves, only to become eventually a victim of counter-pressing. Furthermore, Bayern have a great set-up in the middle. With Martinez and Schweinsteiger they have two players who can play both as strong, proactive defensive midfielders as well as box-to-box players. Defensively, the two can also be both hunter and gatherer. Especially Martinez is absolutely world class as collector of loose balls or supporter in duels. Dortmund had huge problems with it, because Bayern’s set-up came into play especially in counter-pressing. Bayern generally showed an incredibly strong counter-pressing. Especially significant was the fact that the 1:0 by Arjen Robben came about after a counter-pressing action from Philipp Lahm – once again, Jürgen Klopp’s saying “counter-pressing is the best playmaker” came true. It was also interesting to see a slight hesitation in the whole Bayern team when a ball was lost – they did not employ counter-pressing just out of principle and independently from the situation, but seemed to play it almost instinctively. Lahm saw that stability was threatened but that a chance of successful counter-pressing was available – and he acted. Otherwise, Bayern deserve praise for the proactive defensive work – whether by Martinez, Schweinsteiger, Dante, or even Van Buyten – as they relied much on anticipation, generating pressure, and movement. The inclusion of the Belgian in the line-up met some apprehension by some, but it was the right decision. With his aerial ability, recent playing experience and routine he did not fall behind teammates or Dortmund players. These attributes resulted at halftime in the following interesting statistics: Bayern had 82% pass completion, Dortmund only 68% – a shockingly poor value for their standards. Consequently, Bayern could also claim an impressive 62% ball possession and did not allow a single shot on goal. Throughout the first half statisticians registered only one shot attempt on goal for Dortmund; however, it was blocked. Dortmund’s system was also responsible that the BVB had hardly access to the ball or chances to attack. They started in a 4-5-1 with a flat midfield five. 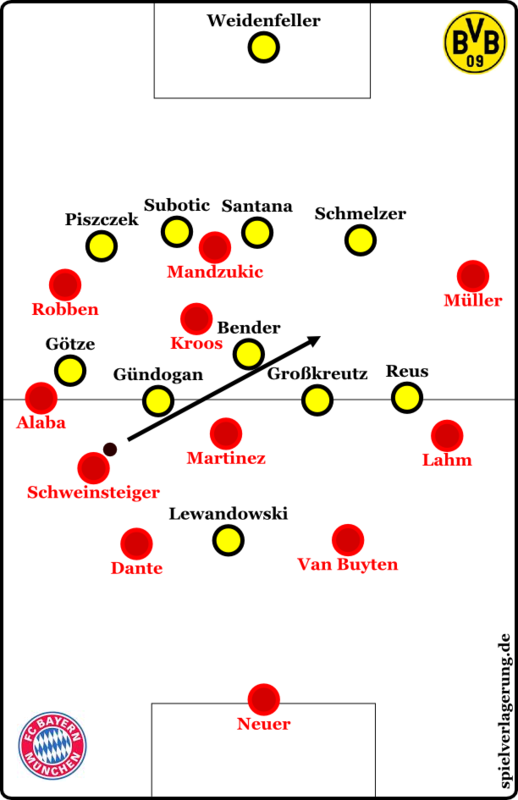 It featured Ilkay Gündogan as half player on the right in central midfield, Kevin Grosskreutz started on the left side. Sven Bender acted in the centre. Grosskreutz’ start came as a bit of a surprise. Maybe they wanted to feature a player enormously strong and intelligent in combination play and a great runner for counter attacks. It is also possible that Arjen Robben was expected to play on the right side; Grosskreutz might have been intended as an additional stabilizer against inverted runs. But he was not much help in the build-up play. With two strikers, Bayern managed surprisingly well to prevent passes into the middle. All in all there was little if any surplus and very little new in the black and yellow 4-5-1. As usual, the half players moved out and wanted to put Bayern under pressure in their defensive half spaces. Thus (among other aspects) Dortmund tried to mix stability in the 4-5-1, access to the opponent and counter attacking options. We have stated on various occasions that the biggest problem of the 4-5-1 is the offensive phase. Often there is a lack of playable reference points in depth, and the opponent is not properly elicited and fans deliberately less. Besides, the potential offensive paths are longer. The BVB tries to counteract this with their player material and a higher formation. By moving out they ensure the maintenance of a relatively high formation and try to stand very compactly in the vertical. Here again, there is a problem – namely a high defensive line with plenty of space behind it. Therefore, Dortmund likes to leave a bit of room in the space between the lines and tries to encircle opponents there. Bayern counteracted this attempted encirclement. They reacted to the high defensive line and the compression of the space between the lines by enormously dynamic short passing relays in this “encircled” region. However, it was also impressive how Munich came into this space at all. Previously, space was “eaten” by Dortmund after the inverted runs of the Bayern wingers. In 4-5-1, this is difficult because of the different width graduation, although one can press more intensely on the sides. Bayern played many diagonal balls to work around this pressing. They used Dortmund’s indention and a wide positioning of the wingers. The two central defenders fanned widely as usual and then played diagonal balls to the far side of the ball. They were not the only one to play those diagonal balls. Schweinsteiger played them as well – those long balls represent his greatest strength. He tilted to the left again and again, pushed Alaba higher and played diagonal balls with his strong right foot. Again, there were interesting synergies. He could put the ball back and thus away from the opponent. At the same time there was an outstanding pressing player with almost unique intelligence and timing on the targeted right side – Philipp Lahm. This was another offensive but stable factor. The most important aspect was probably the lateral reach of these diagonal balls made possible by Dortmund’s shifting. The BVB indents more – in the 4-5-1 as well – than almost any other team. The high movement of the midfielders in the half-positions creates a hole that is closed by even a little more indention. But before the BVB is able to apply pressure, the diagonal balls come to the Bayern wingers positioned very widely. They can handle the ball before Dortmund has re-formed. As the latter orientate themselves towards the ball Bayern can move up – this was advantage number two of the long diagonal balls. There is plenty of time to move forward and get higher, thus using the disadvantage of the 4-5-1 for the BVB in terms of offensive access. Through moving up to the front Bayern could also keep the game well in view and aim for the open spaces where they got balls; if possible behind the 4-5-1. From there, they played quick passes and went back over to the other side. There were also many long direct switches to the other side instead of indirect short ones by Bayern. Thus, the game was quickly shifted and new situations were created, keeping the game and the pass combinations dynamic and flexible. Some statistics about this: 19% of Bayern’s passes consisted of long balls or crosses. Dortmund featured 19% as well, but with less pass completion and ball possession. As benchmarks I suggest to use Manchester United in their last league match against QPR (13%), Barcelona vs Real (7%), Real against Barcelona (18%) and Juventus against Siena (11%). In this way the Rekordmeister infiltrated Dortmund’s space between the lines and still remained stable due to the accuracy employed. Collectively moving forward they were also more present on second balls and, with their counter-pressing, sat more firmly in the Dortmund half. With some through balls and lobs they could even circumvent Dortmund’s defensive, especially if the defenders wanted to compress the space between the lines. Then they were at a disadvantage because of their forward movement and had to be careful – which in turn resulted at times in less movement forward, putting Bayern less under pressure. But that wasn’t all. Jupp Heynckes tinkered with the build-up play as well, not just with the offensive. Besides Schweinsteiger’s deep tilting to the left there were good movements in the centre. Javi Martinez pushed forward with pleasure, and pressed Großkreutz back several times when the latter tried to move up. Martinez’ pushing forward was not only important in disturbing the Dortmund system, but also for Munich’s offensive and defensive play. For example, Martinez served as a pressing-resistant reference point in packed areas after diagonal balls. If these passes failed to connect or got intercepted by Dortmund Martinez was used as a hunter – he then acted as the most important part of the counter-pressing and put the opponent under pressure, thanks to his outstanding defensive movement. Apart from the diagonal balls, at several times the sides were overloaded by crosses and back passes. Kroos falling back in build-up play and the movement of the Double Six (DMs) was effective as well, for Schweinsteiger and Martinez took turns in moving up after overcoming Dortmund’s midfield of five. I would like to mention an exemplary gameplay that was used often and with a healthy, situational flexibility. Mandzukic often moved far to the right side while Robben came from the left to the middle. Kroos then usually waited with one of the Eights in the back and Mueller moved diagonally into the box, which meant a lot of movement and a lot of players ideally used (excluding Mandzukic, who still fulfilled his role excellently and was important for defensive stability). Naturally, Klopp reacted to all these moves and ideas of Bayern. Between the 20th and 30th Minute there was a constant change of sides between Marco Reus and Mario Götze, though without result. Was it coincidence? Was Reus to be pitched against the very fast Alaba? In any case, this change was reversed soon. In general, they tried it to increase fluidity for Götze and put him a bit higher in defensive play as well. He was supposed to run at Schweinsteiger and still keep Alaba in his coverage shadow. Major changes were due in the second half. In the second half the BVB stopped pressing constantly with a flat five but moved more ahead in a 4-3-3. Bayern on the other hand went into an attitude concentrating on counter-attacks. They probably hoped for more stability and wanted to use their dynamic players and to elicit Dortmund. This game plan did not really work for Bayern. In the 52nd Minute, the BVB made their first attempted shot on goal; others would follow. Bayern changed the strategy and its tactical implementation. They now used their fullback more diagonally in the offensive on the break, and the double six stood more constantly in one line. Counterattacking was done very flexibly and used the positional versatility of the offensive players. In the 64th Minute Arjen Robben was up front with Thomas Müller when pressing. However, there was less aggressiveness in attacking pressing, which was what made this playing style possible. Main objective was no longer the generation of pressure and getting the ball, but the delay and control of the opponents’ attacks. Thus, the Bavarian control of space was restricted. Klopp continued to adapt. Dortmund’s higher focus on the sides was now consciously played, resulting in several crosses and attacks if barely big chances. Kevin Grosskreutz was replaced with Jakub Blaszczykowski. He took Götze’s position (when in possession of the ball), as Götze was supposed to increasingly fall backwards. 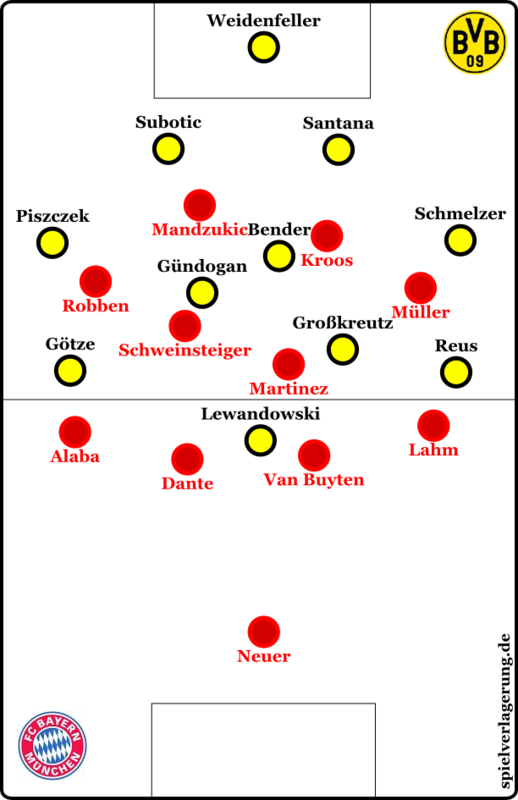 In addition, the fullbacks of the BVB acted much higher, and the back-tilting Six was increasingly used. The BVB’s attacking now looked very fluid: Robert Lewandowski went more strongly to the left, Reus and Kuba as well acted as strikers. Götze was supposed to act as the playmaker and create brilliant ideas. Defensively it was a clear 4-3-3 with sporadic gambling by Marco Reus. Götze’s falling back from the nominal striker position in the build-up play was shadowed by Martinez who acted with much tactical diligence. At first Gündogan had moved to the rear, but in the closing stages it was increasingly Bender who tilted back. Now the fullbacks played very high and the centre-backs were also extremely wide. Its purpose was to pull the Bavarian attack apart and to open the middle; or to play line passes with the central defenders along the sides. But nothing brought a significant change, although Dortmund had at least some opportunities in the second half. Bayern continued to rely on counter-attacking strength and stability while staying deep. Jupp Heynckes brought Luiz Gustavo for Thomas Müller and Arjen Robben took the right winger’s position. With strikers Mandzukic and Robben, Schweinsteiger as Eight before a double Six, and Kroos on the left there was a higher stability and some good counter-attacks. Robben could gamble a few times because Schweinsteiger and Mandzukic filled the space for him. This 4-5-1/4-4-2 of Bayern was in theory very interesting and pressed Dortmund increasingly on the sides. Klopp logically brought Schieber in to create more danger from headers; the decision to take Reus off was right as well. His greatest strength, the fast infiltration of open spaces, was no longer of central importance in this situation. An excellent game; only goals were missing. Bayern had several chances but did not score – too often they were offside, due to Dortmund’s play and orientation. All in all it was a show of force in the first half and a match of equals in the second, with a slight advantage for Bayern due to context. Bayern impressed once again with stability. Whether attacking pressing, counter-pressing or pressing backwards – in all aspects Bayern were outstanding if they wanted to be. Dortmund persisted, adapted all the time, but failed because of the intelligence of the Munich collective and a missing connection between midfield and attack, especially in the central space between lines; exactly the space they had taken so expertly from Bayern in recent years. Special praise is exceptionally not due to Martinez but to Bastian Schweinsteiger, Philipp Lahm and Mario Mandzukic; in that order. Schweinsteiger played 13 completed long passes – as many as Dortmund’s Top4 jointly did (the very strong Weidenfeller, Gündogan, Santana and Bender) and the two Bavarian field players following in the rankings (Alaba and Dante). Bayern seems to continue to be in top form individually and collectively. But Dortmund managed to keep up, even if they did not create any chances in the first half. After this game, we can nevertheless say something for sure: Bayern against Dortmund is clearly one of the most interesting duels in Europe. Written by RM, translated by PF. Spielverlagerung wants to thank PF for his work on our site and the translation. Anyways, there are only five things PF enjoys more than football. One of them is language. We are delighted to be able to use this for us. Wow….just wow!!! Fantastic analysis…this is what I’ve been looking for…my football IQ (albeit low to begin with) just tripled. Thank you. Das mit dem Korrekturlesen wurde nun schon häufiger angesprochen. Eventuell könnten ambitionierte Leser sich dafür anbieten. Wenn die SV-Autoren so einen Pool aufbauen, könnten Sie die Artikel an diese verschicken und sobald einer drübergesehen hat das ganze auf die Homepage schieben? Ich würde mich dafür anbieten, auf deutsch und auf englisch. Eine direkte Antwort kann ich jedoch nicht immer garantieren. I find it great to have the articles in English. Keep up the good work! A Big hurray for the worker who did the translation. Even if there should be some minor errors (i didn’t read the translation), the criticizm is unjust and brutal. First of all; a translation is a different kind of textproducing than originally writing. Second of all; give him a little bit of time to sort the work out; and last but nor least; shame in you. The ones who don’t speak german are happy for the translation. And who are you to grump. das ist schon arg gefilsert. ich würde einen muttersprachler engagieren. generell ist die Idee englischer Artikel ganz gut, aber ich kann nur empfehlen, dass das ein Muttersprachler (oder jemand der Englisch kann :D) vor der Veröffentlichung gegenliest. Teilweise echt grausig. Great way to expand the audience of your blog. Compared to other tactic blogs your analyses are profound and very often extraordinarily well sourced. Keep up the good work! I do not think that Bayern copied Klopps tactic. I think Heynckes developed his own style. He reinvented himself. The basis of Bayern’s style is – still – van Gaal’s style. Does anyone remember the UCL-Game against Juventus in 2010? Here you can find the blueprint of the new Bayern-Style. Heynckes, as pointed out above, worked on it like a carver, since he quickly found out that the players believed in van Gaal’s philosophy. Heynckes added stability, diagonal balls and a mixture of structured chaos (Ribery!) and some set plays. But the most important thing is: the Team seems to be on a mission. Bayern played hard, pretty hard (i liked it) and with poise. I think it’s a fantastic idea to have some of the articles translated into english. I myself read all the articles on this site and I think they should be accessible to english readers as well. They should be able to profit from the great analytical work done by the writers! But as much as I am supportive of this, I think the translation should be better. some of the sentences are incorrect or, at the very least, not particularly elegant (e.g. “on our site included” should read including on our site or something similar). This is not meant to discourage you guys. The level of writing should however reflect the level of the content, which is tremendously high! Thank you so much for the English version! I am such a fan! I love this website despite not able to speak a word of German. I usually utilize Google Translate together with Bing Translate to generate the idea of the analysis. The details, are, however often messed up because, not surprisingly, online translator are pretty limited. When the sentences are long and beautiful, the auto-translated results are often fragmented and hard to read, not to mention the football terminologies. It’s a pity that I cannot make the best use of this website due to the language barrier. Too many good pieces here to read, especially about the Bundesliga teams, German national teams and well….Real Madrid. SV could help changing the still widely spread opinion that “soccer” is not a of coaches’ sport and has no tactical depth. Für uns Deutsche mag dieser Artikel wunderbar funktionieren. Ob aber die Muttersprachler diese ziemlich direkte Übersetzung so zu schätzen wissen, muss sich meiner meinung nach noch zeigen. Sprache ist für mich nicht gleich Sprache. Um es wirklich rund zu machen ist mMn mehr nötig. Nun gut, was die taktischen Aspekte betrifft, wird jeder Engländer diesen Text verstehen. Zumindest wenn er ein wenig von Fußball versteht. Maybe the comments should also be in English below these articles if you want to provide a platform for an English-speaking audience. As a German expat living in the USA now for over 12 years, I think this could provide a bigger audience for high quality Bundesliga (and beyond) analysis in the US. From a US perspective you might think of contacting Foxsoccer or NBCSports to get exposure similar to the deal with BettingExperts, ZDFsport, or the deal Mr. Cox has with ESPN. Foxsoccer owns the rights to Champions League games for the next couple of seasons and might be interested in in-depth coverage of the German UCL teams on game day, tactical previews, squad or coach analysis. NBCSports will start coverage of the Premier League next season and might also be an interested provider. Unfortunately, the US rights with the Bundesliga are with a minor cable channel (GoalTV) which hardly anyone can get. Ist Counterpressing als Übersetzung für Gegenpressing eigentlich ein fest stehender Begriff? In einem Artikel wurde doch aufgegriffen, dass es für Gegenpressing keinen standardisierten Begriff gäbe. Aber trotzdem eine klasse Idee, den Artikel auch auf Englisch zu veröffentlichen! Find ich gut, so haben die Engländer auch mal einen Vergleichswert zu zonalmarking.